On 17 October, Ostroh Academy students had a unique opportunity to associate with Roman Revakovych and Antoni Wit, the outstanding members of the European music centre. This year, the whole music world celebrates the first centenary of the birth of Polish composer Witold Lutoslawski. In this regard, several concerts conducted by Roman Revakovych have been given in Ukraine. Antoni Wit conducted the final concert in Lviv held on 11 October. After the concert, the maestro and his wife asked Mr Revakovych to show them Ukraine. Roman Revakovych, who is a good friend of Ostroh Academy, decided that Ukraine should be shown not only through the prism of historical locations. That is why he offered to meet with Ukraine’s younger generation, the students of Ostroh Academy. 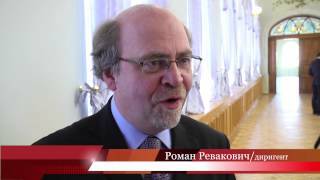 It is worth reminding that Roman Revakovych already visited Ostroh Academy last year. He promised then to bring famous musicians to Ostroh Academy. Mr Revakovych began his cooperation with Antoni Wit during the third Ukrainian music festival in Warsaw. Owing to Antoni Wit, the Days of Ukrainian Music have become an important part of the annual cycle of music of the Warsaw Philharmonic. Mr Wit has performed almost in all music centres of Europe, Asia, Australia and Americas. He has recorded more than 200 CDs that have received various awards, including seven Grammy nominations, a Diapason d’Or nomination and others. He belongs to a small circle of artists who sold a total circulation of nearly five million copies of CDs. By the way, Antoni Wit promised to send some of his disks to Ostroh Academy students. He said he knew a little about Ukrainian music. Right now, he is interested in the masterpieces by Myroslav Skoryk, and he will study the music of other Ukrainian composers after the visit to Ukraine. The guests also reassured the students that the modern Polish elite knows a lot about Ukrainian music. After the Kontrasty festival, Polish music experts have written multiple times that Ukrainian classical music is one of the most fascinating modern discoveries. Ihor Pasichnyk, Rector of Ostroh Academy, expressed his gratitude to the guests and gave them books and souvenirs as a present. OA students hope that Roman Revakovych will come back next year not only to accompany another talented person like Antoni Wit, but also to give his own concert.